This lovely chiffon dress has a strapless sweetheart neckline with boning at the bust. The bust is fully lined and made of sheer mesh with 3-dimensional floral appliques throughout. The empire waist gives way to the chiffon high low skirt that is lined to the mid-thigh. A fabric sash wraps around the waist and can be tied into a bow or left to hang. A hidden back zipper completes this dress. 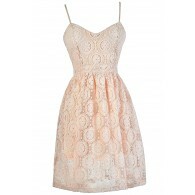 The Rosette Romance Designer High Low Dress would look great paired with pumps or strappy heels and a clutch. Also available in Ivory. Details: Made in USA. Lined to mid-thigh. Hidden back zipper. 100% polyester. Lining: 100% polyester. Hand wash. Do not bleach. Low iron. Hang to dry. Do not wring. Small measurements: Length from top of bust to hemline: 29-44”. Bust: 32”. 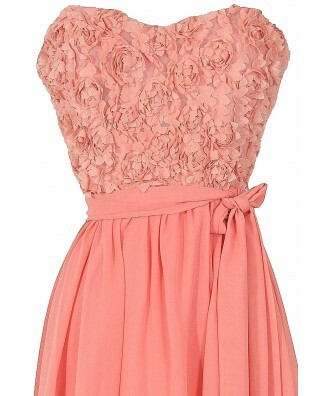 You have added Rosette Romance Designer High Low Dress in Pink into Wishlist. 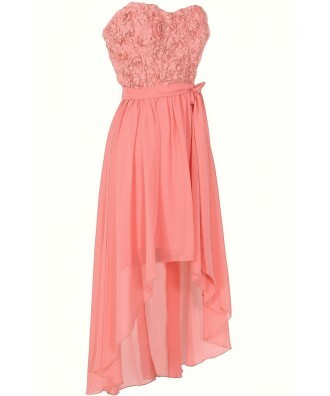 You have added Rosette Romance Designer High Low Dress in Pink for Stock Notification. 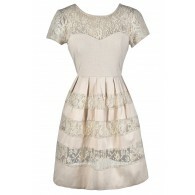 You have set Rosette Romance Designer High Low Dress in Pink as a loved product. 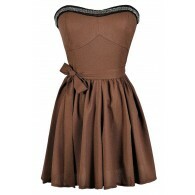 You have removed Rosette Romance Designer High Low Dress in Pink as a loved product.